A Bristol Blenheim IV bomber, serial number N3533, was reported to have made a crash landing at 12:50 on Sunday April 19, 1942 at Glebe, Linsfort near Fort Dunree in the far north of County Donegal in the north of Ireland (Republic of Ireland). The Irish Army were as always quickly on the scene to assist those involved. The Irish Military report on this crash is held in the Military Archives in Rathmines, Dublin City. The report (Ref G2/X/1004) mentions that injuries to the crew men were facial abrasions only. They were taken to a local Irish Army base, Fort Dunree, where they were treated for their injuries. The crew of four crew reported they were on a training exercise with the army and had gotten lost and run low on fuel. At 21:50 that Sunday evening the crew were allowed to leave and were brought to a border crossing at Bridgend and handed over to the authorities in Northern Ireland. This took place at a time when the policy of the Irish authorities was changing to one of releasing almost all Allied airmen who found themselves in Ireland. The aircraft carried a crew of four, and their names and addresses were recorded by the Irish Army before their release. 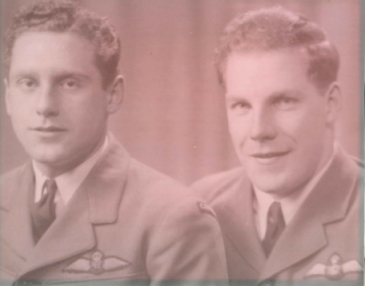 After some research it was possible to identify their correct names and serial numbers and luckily contact has been made with three of their families and Mr Frank Newbold who was on the aircraft. BERTRAND, Donald (Don) WWII Veteran (RAF/RCAF- Pilot) Retired Chief of Air Traffic Control In Ottawa, Ontario on Monday, December 22, 2008. It is with profound sadness yet incredible memories that we announce the death of our husband, father, grandpa and friend, Don Bertrand, peacefully at home with his family by his side. He was the devoted husband, partner and best friend of 64 years to Audrey Bertrand (Villeneuve). Always a fighter, he never stopped passing on his unparalleled determination, wisdom, and passion for life. It was an honour to be part of his family and a privilege to be one of his friends. Loving father of the late Ken (Nicole Roussel), Susan (Tony Fisher) and Nancy (Roger Brule). Greatest Papoo ever to Christian, Jonathon, Jenna and Jessica. Son of the late Joseph and Muriel Bertrand. Brother of the late Norm (Pat), the late Mary (the late Edward) and Eileen. A special thanks to all of the dedicated caregivers who were so much a part of his life. A memorial mass to celebrate Don's life will be held Tuesday, December 30, 2008 at 2:00 p.m. at Holy Cross Parish, 685 Walkley Road, Ottawa. Sgt Clarence Morton was operating as a wireless telegraphy (W/T) instructor in the aircraft during this flight. Clarence, or Clarry, as he was known to his family, came from Cleethorpes in Lincolnshire, England. He enlisted with the Air Force in May 1940 and progressed through his training in wireless telegraphy and aerial gunnery throughout 1940 and 1941. His initial posting was to 404 (RCAF) Squadron in December 1941, along with crew of P/O A G E Harding and P/O J F Clark. His first combat missions being flown from the start of February 1942. At the end of March 1942, he and six crews were posted to 143 Squadron. As described below, this unit was carrying out training duties at this time. He stayed with 143 Squadron until the autumn. When they converted to two seat Beaufighters, the WO/AG's like Clarence were no longer needed and were posted to 86 Squadron in October 1942. Similar to the 143 Squadron situation earlier in the year, 86 Squadron was engaged at that time is preparing crews for the new 160 Squadron, which in turn was being posted overseas. 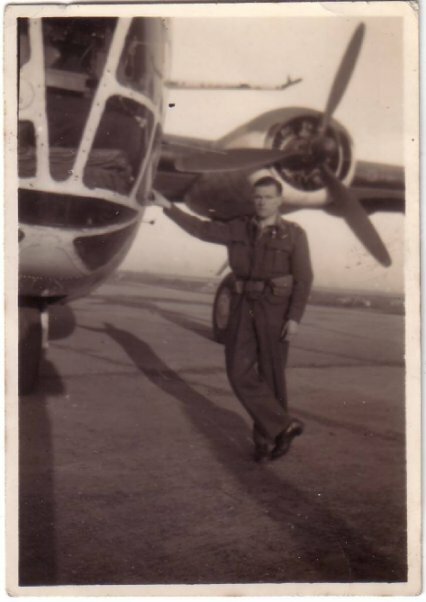 He was posted to 160 Squadron in November 1942, being then sent to India to fly in Liberator four engine bombers with that unit. He returned to the UK in April 1944 and was based at a secession of training units, probably in the instructing role until his discharge in January 1946. He does not appear to have suffered prolonged injury after the crash as his service file records no long period of hospitalization. Clarry passed away in 2004 in Cleethorpes at the age of 87. His son was kind enough to send on copies of his service record, photos and the scanned page from his log book below, where P/O Harding's name can be seen. 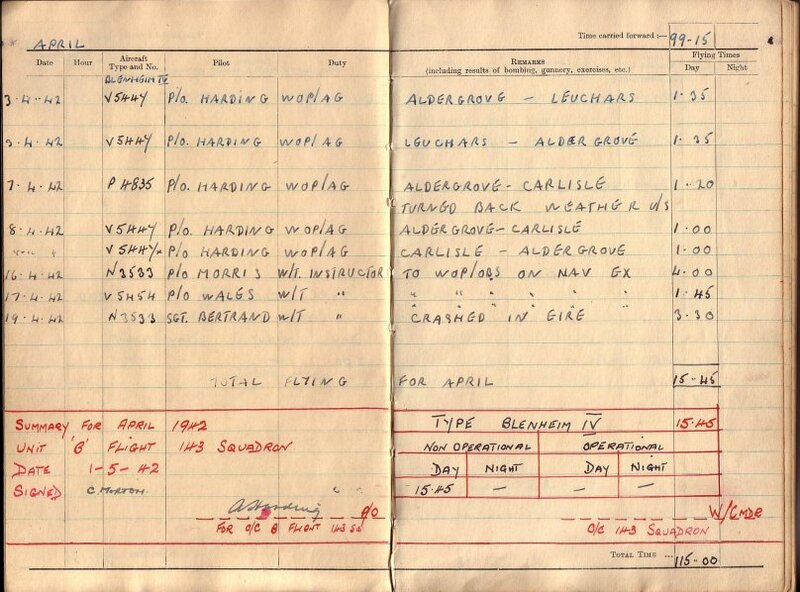 Squadron records from 143 Squadron show that Sgt Morton was involved on a daily basis in March and April as an instructor to the Wireless Operators/Observersundergoing training. He was part of a crew which on 7th of April were forced to turn back from a flight to Carlisle due to poor weather. 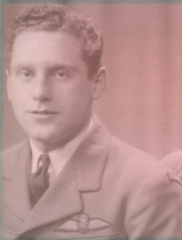 Sgt Renard Lendal Smith was undergoing training as a Wireless Operator Observer during this time with 143 Squadron. This would have prepared him to take up these duties in the two seat Beaufighter aircraft which the Squadron were due to obtain the coming months. Renard, or Rennie to his family, came from Dunbarton in Scotland, born in 1919. Squadron records show that he returned to 143 Squadron on 20th of August from Aircrew Convalescent Depot (ADC) at Hoylake. He was next posted to Uxbridge on 21 oct 1942, listed as non-effective. At this time the squadron was based at Docking and a few days later moved again to North Coates. 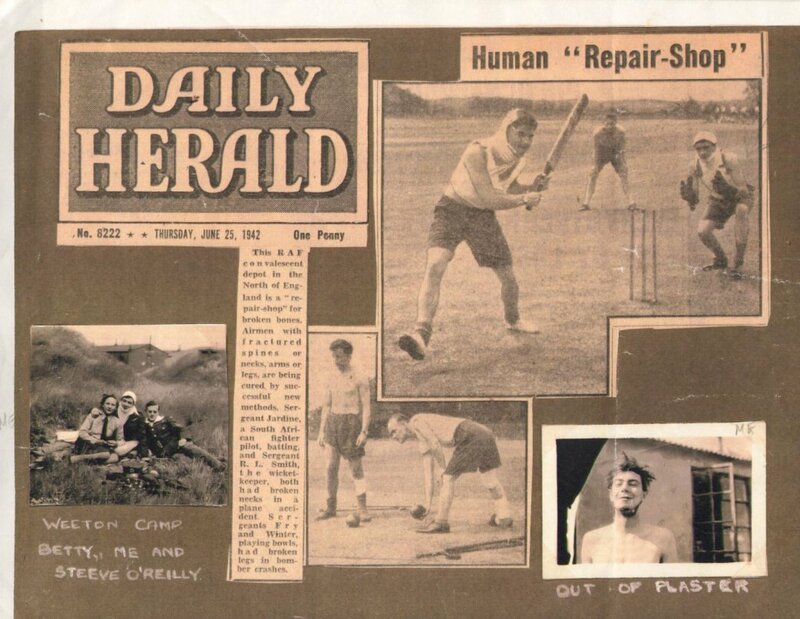 His daughter was able to send on this interesting newspaper cutting showing her father during his recuperation in Scotland! 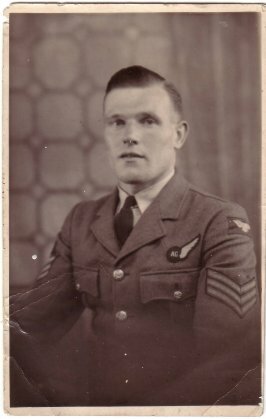 Sgt Smith returned to 143 Squadron and continued to serve in the RAF. His daughter understands he went on to serve in Malta and over Yugoslavia. His name appears in the London Gazette dated 16 January 1945 where he was appointed to Commission as an Acting Pilot Officer (Officer Serial Number 187595) in the Administrative and Special Duties Branch of the RAFVR. This suggests that he had finished flying duties at that time as flight crew would generally be found in the General Duties Branch. His name appears in the 14 March 1950 Gazette as being promoted to Flying Officer rank in the Training Branch of the post war RAFVR. He left the RAFVR the following year per the London Gazette. He married in 1945, went back to study Accountancy at Edinburgh University and worked for HM Customs until his retirement. Rennie Smith passed away in April 2001. The Blenheim in the accident had three crew - pilot, navigator, and rear gunner. There was also a passenger who came along for the ride, and with whose authority I do not know. The aim was to fly to Rockall, in the Atlantic west of the Hebrides, a small rock sticking up a few feet out of the water, and a useful if difficult navigational test of accuracy. The navigator sat either in the aircraft nose or in a seat by the pilot, but at a lower level. On this flight the passenger took the navigator's seat by the pilot, and the navigator, for landing and take off, sat on the knees of the passenger, who gripped him round the middle. For this particular forced landing, I was the one who had to sit on the passengers knees with only his arms to hold and restrain me in the forced landing. Otherwise I sat in the extended nose to do the navigating work. After reaching and circling Rockall we set course southwards for the nearest part of the north coast of Ireland with the intention of then heading eastwards when the coast was reached. Then we headed towards Aldergrove in the distance, our destination for landing, and the coast was followed for some of the route. The weather was clear for visual decision on this. Our height was up to 2000 feet, but we also flew at intervals down to 50 feet, as usual in Coastal Command. The passenger was in the seat next to but lower that the pilot, which was the seat which should have been reserved for me as navigator, during take-off and landing. On one occasion on the flight back and during the coast crawl the pilot flew the aircraft into an entrance into the cliffs which proved to be a circular and narrow bay, and was able to bank sharply, practically scraping the cliff face before emerging into safety, and I will say that he acted very coolly in a desperate situation. I cannot give any reason for what happened next. As far as I knew we were making a safe level coast crawl to Aldergrove in the distance, and I was not consulted over the decision to lower the undercarriage, which was normally only carried out for landing on a proper runway. I think the aircraft catapulted on striking objects at ground level. All I recall is finding myself staggering around in the wreckage. I cannot say what injuries were suffered by the others: I never saw them again. The pilot was Canadian and I had never seen him before the flight, and I never saw him afterwards. I heard he returned to Canada. Having suffered an injury to his knee, he was sent to recover in Matlock near his home in Derby. Frank spent the remainder of the war in Air Traffic Control roles, including in East Anglia and later in Algeria, Tunisia and in Italy. He developed a keen interest in bird watching after the war and he and his wife have enjoyed many holidays in Ireland over the years, particularly in the Burren in County Clare. He and his wife are very fond of Irish music and exploring the Burren was marvellous for them, as they are enthusiastic amateur botanists and were privileged to see many flowering orchids while on their trips. In John Quinn's 1998 book, "Down in a Free State", he briefly mentions this aircraft and lists the crew's names as given in the Irish Army wartime report. The aircraft it seems landed very near to Glebe Rectory close to the shore of Lough Swilly. J. Quinn visited the crash site and spoke to the owner of the rectory in 1990. The Irish Army report records that the aircraft was badly burned and damaged beyond repair. The wreckage of the aircraft was gathered up by locally based Army soldiers and was brought to Fort Dunree where it lay for some months. This crew were flying with RAF 143 Squadron which had just been disbanded and at the end of February 1942 consisted of only a cadre of airmen and one unserviceable Blenheim. During March however, the Squadron again was brought up to strength and various aircraft were assigned to it from other squadrons. The serviceability of the various Blenheims was however a problem for the unit. It is expected that Sgt's Newbold and Smith were posted in around this time; no specific mention of Sgt Newbold by name is made in the Squadron ORB, but R L Smith is mentioned at least once as being instructed by Sgt Morton. It is interesting to note that at this time, the officer Commanding 143 Squadron was Squadron Leader John Basil Holgate 33426 who himself had crashed outside Dublin in May 1941. He escaped from internment in July 1941. "Crashed in neutral territory. Stb. Engine heating up. Weather bad, unable to ascertain position when making landfall. Tried to land in large field with wheels down, hit stone fence (Pilot) Sgt injured, 4 Sgts"
The text is difficult to read as the report comes from a microfilm in the Royal Air Force Museum in Hendon, north of London. Only the pilots name is given on the report as this was normal practise. The aircraft, A Bristol Blenheim IV had only arrived on the Squadron on March 25, 1942 from 404 (RCAF) Squadron. 143 Squadron was at this time tasked with training duties based at Aldergrove airport outside Belfast, Northern Ireland. The Squadron record further records that N3533 suffered a mishap on take-off due to a burst tire on the 30 March. Damage was negligible however. The loss of N3533 is recorded in little detail in the unit records other than to say the aircraft had crashed at Buncrana in the IFS (Irish Free State). The cause of the loss was not known and the crew were reported to have returned to the unit on the 21 April where three of them were admitted to the Station Sick Quarters. It seems to imply that one of them remained at Eglinton air field. The Morton family were able to obtain from the RAF in 2008, a redacted copy of the Air Ministry Form 765, a document titled "REPORT ON FLYING ACCIDENT OR FORCED LANDING NOT ATTRIBUTABLE TO ENEMY ACTION". This document in itself lists little more information than the Form 1180, other than adding the remaining three men's names. The various fields in the report are generally blank other than to record that appropriate information will be ascertained from the crew when they return to the unit. This report was signed off on 23 April 1942. With it was received the text of a statement filed by Sgt C. Morton. This records that the nature of the trip was a navigational exercise with [the other crew members]. He was the W/T instructor on the aircraft. The weather deteriorated rapidly and the height of the aircraft on the way back to base was varying between 100 and 3-0 feet. At the navigators request the pilot obtained a series of QDMs but, owing to the fact that when land was struck in very bad visibility it appeared to be surrounded by high hills and the QDM was followed by QDC which indicated the presence of a balloon barrage under circumstances at the time of which he was ignorant. [The pilot] decided to land in a field previously picked out. On attempting this the wheels struck the top of a wall. The aircraft was catapulted forward on to its nose, both wings became detached from the fuselage which broke in half, the aircraft then turned over and caught fire. After getting clear of the wreckage the starboard tank ignited and blew up. 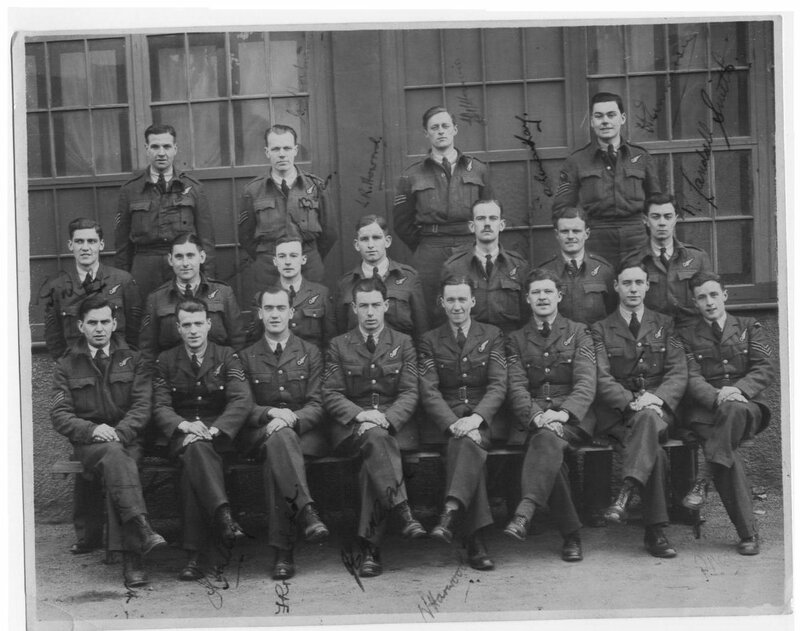 The W/Op - Observers of 143 Squadron taken at Squires Gate RAF Station on 1st March 1942. If correct, at least Leslie M Smith from this group did not survive the war having been killed with 143 Squadron in May 1943. Beaufighter JL887 went missing that day on a mission off the Dutch coast.